This post is about knitting, which takes up a fair amount of what little free time I have and is pretty much my main source of competition with reading. If only I could learn how to do both at the same time, I would be set for life. So I’ve been knitting for about 4 years, I started when I was 20. I dabbled in crocheting a little bit, but my heart is with knitting. I tend to make clothes rather than scarves because I find scarves too boring, and I never remember to grab one when I’m running out of the house early in the morning. Sweaters are fun to make, because I can play around with patterns, size it exactly and pick out the exact colors that I want. I used to knit with two needles, now I knit pretty much only on circular needles and everything I knit, I knit in the round. Sleeves I have issues with. Keeping track of my patterns I have issues with. But eventually I’ll be able to translate my work into a series of abbreviations and notations that only make sense to knitters. I don’t have pictures of the projects I’m working on now, but I’ll post the sweaters/jackets/cardigans I’ve made in the past 3 years. Simply Marilyn from Interweave Knits. 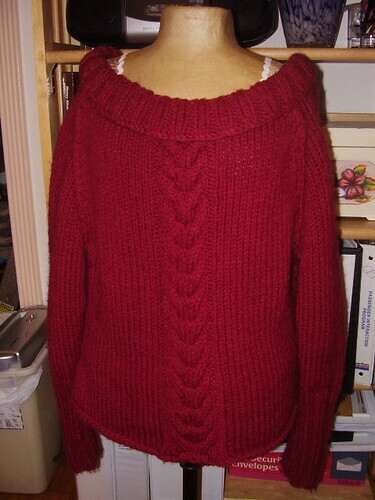 I knit this with Plymouth Encore Chunky in red. I used about 5 skeins, and size 10 needles. It took about 4 days to make, it knit up very very quickly. Ticuna from Berrocco. The pattern is for a vest, but I made a sweater out of it. 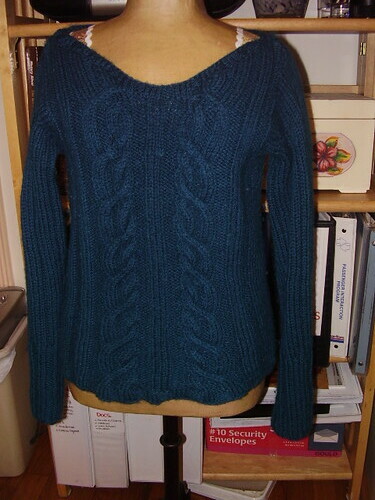 I knit this with Knit Picks Wool of the Andes in Blueberry, although the color is more green than blue. This took a couple of weeks because I had school work getting in the way. This was knit in the round on size 8 circs. I used about…6 balls of Wool of the Andes. 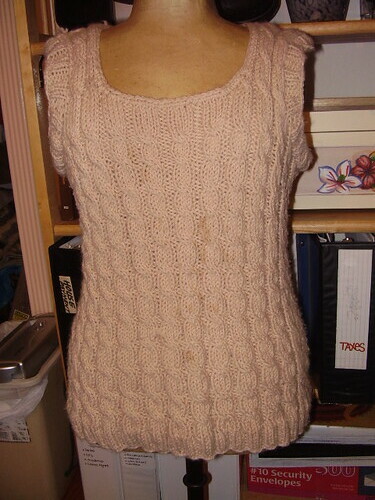 This sweatervest is made with Plymouth Encore in their beige color. I used about 3 skeins on size 8 circs. This didn’t take very long to make at all, and it was a lot of fun. I wear it all the time. I’ll post more when I take more pictures. In the meantime, I am working on a sweater with 3 Cascade 220 Heather’s, and I was at the Stitches West knitting Convention in Santa Clara on Sunday, so I have lots and lots of pretty yarn to use for projects from that trip.